I saw this recipe posted on Noblepig.com and it looked fantastic, so I decided to try a slow cooker version. Tomatoes are a tough sell in our house, but if they are pureed, no problem. That gave the soup a nice thickness. You can swap fresh basil for dried if you don't have it on hand. The three chorizo sausages I used were about 6 inch links, so you might need to use four of them if the kind you are using are smaller. Slice raw chorizo into bite sized medallions, with casing still on. Grease a large frying pan with canola oil spray and set to medium heat. Brown the chorizo pieces on the outside (they do not have to be fully cooked through), and set aside. Pour canned tomatoes into slow cooker pot, and add onions, garlic, basil, tomato paste, sugar, and seasonings. Use an immersion blender to puree the contents of the slow cooker. Add chicken broth, diced red peppers, and browned chorizo pieces to the slow cooker. Cook on low for four hours. 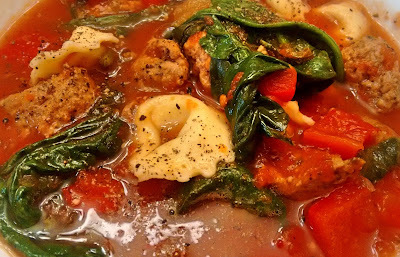 Cook tortellini according to the package, while it is cooking, remove lid from slow cooker, and add baby spinach. Allow to wilt. Drain the tortellini, and scoop into large bowls. Stir the soup, then ladle soup on top of tortellini to serve.